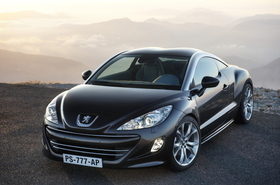 The Peugeot RCZ will be made at Magna Steyr's plant in Graz, Austria. Peugeot says the RCZ marks a new chapter in the French automakers history of producing so-called lifestyle vehicles -- niche cars that are innovative, expressive and fuel-efficient. The production version of the RCZ will debut at the Frankfurt auto show in September. European sales of the car start in spring 2010. The low-volume 2+2 coupe arrives two years after the 308 RCZ concept car was unveiled in the German city. The RCZ will offer three powertrain options when it debuts next year. At launch, customers will be able to get the car with Peugeots 2.0-liter, 163hp HDi FAP turbodiesel. The engine provides maximum torque of 340 newton meters (251 foot pounds) and uses 5.4 liters of fuel per 100km (52.3 mpg) with CO2 emissions of 139 grams per kilometer. Peugeot plans to offer two turbocharged direct-injection gasoline engines for the RCZ by next summer. The top-performing of the two powerplants is a new 1.6-liter four-cylinder with 200hp. That engine uses 7.1 liters of fuel per 100km and emits less than 165g/km of CO2. One of the RCZs safety features is a pop-up hood. Using a pyrotechnic triggering system, the RCZs all-aluminum hood raises if the car collides with pedestrian, limiting the degree of injury the person is likely to suffer. The RCZ will be produced by Magna Steyr at the Austrian contract manufacturers plant in Graz.